No world leader seems to impress Trump more. The White House is working to set up a summit between President Trump and Vladimir Putin, though planning is still in the early stages, per a new report in the Wall Street Journal. The purpose of the summit “would be to resolve long-standing differences, people familiar with the matter said,” as well as to discuss Syria, Ukraine, and nuclear-arms control. Though Trump invited Putin to visit the White House during a phone call between the leaders in March, the date and location of the potential summit has not yet been determined. 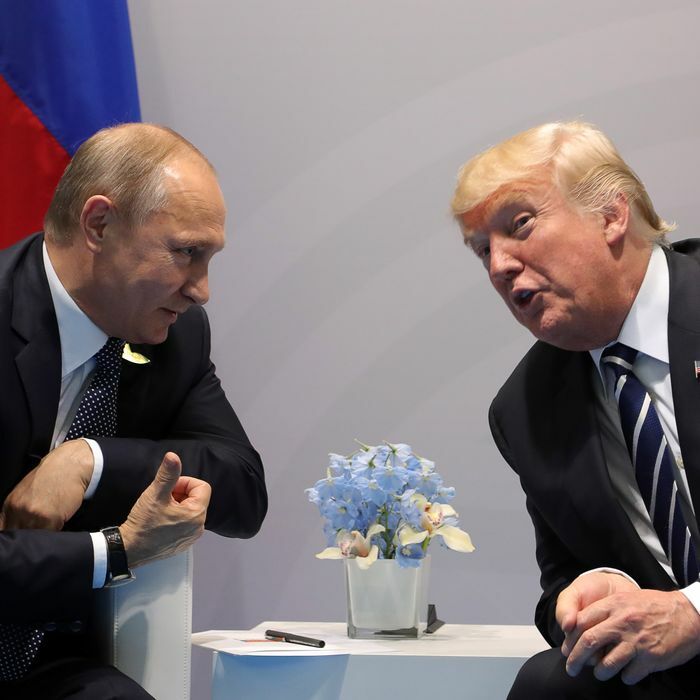 If and when it happens, the summit would be the third in-person meet-up between Trump and Putin, and would undoubtedly be overshadowed by the ongoing investigation into Russia’s election meddling in 2016 by special counsel Robert Mueller. Trump’s attempts to discredit the Russia probe have only gotten more brazen as the inquiry has intensified, and it’s likely that Putin will take advantage of any opportunity to bolster that behavior. President Trump has repeatedly expressed his desire for closer ties with Russia, been eager to follow through on that impulse thus far, and has seemed impressed with Putin’s strength on more than one occasion. “Every time [Putin] sees me he says I didn’t do that and I really believe that when he tells me that, he means it,” Trump told reporters after the Asia summit, further suggesting that he accepted Putin’s “very strong” denials over the conclusions of the U.S. intelligence community. The president also pointed out that Putin felt insulted by the allegations, that insulting Putin wasn’t “a good thing” for the U.S., and that he didn’t feel comfortable arguing about the Russia investigation with him. Trump tried to walk back his seeming capitulation to Putin the next day, but not very convincingly. In March, President Trump ignored his advisers and called Putin to congratulate him for winning yet another less-than-democratic election in Russia — though it should be noted that Trump regularly praises foreign autocrats for their election victories and power grabs. Trump has, on occasion, criticized Russia, most notably when he attacked Putin in April for supporting the Assad regime in Syria, and following the poisoning of a former Russian spy in Britain in March. The Trump administration’s timid stance on sanctioning Russia over its transgressions has led to mixed results.